This Flexible Cable Management System is designed to offer 2 solutions to the customer, depending on which model/configuration you purchase. 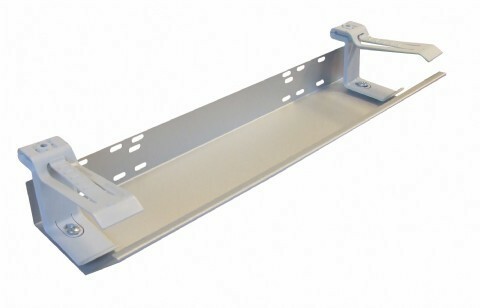 You can either use the cable holder on it's own as a flush mounted method of keeping cables safely tucked away, or you can use it in conjunction with the tray holder, so that you can run a cable tray held in position by these flexible brackets at various points. They system is designed as the name suggests, to flex to allow easy access for cables to be inserted and will sit neatly under your desktop. You can click 'Technical Data' tabs below for more info/application drawings. We list the components seperately, so customers have complete flexibility but you also have the option of purchasing the full kit including the tray if you prefer. Supplied with a 500mm long Metal Tray in Silver and all the neccessary fixings, screws etc. that you'll need. Remember to view the technical data tab below though, where you can find more useful information. That's just a generic lead, in fact it doesn't even look like a photograph - I suspect it's just a rendering. It's only there to show the tray is flexible to be pulled down, allowing easier access.